Lunarfurniture.com – House arrangement is a way which can keep the house’s condition in nice to be seen and neat condition. Besides, if the house is in a nice condition, the appearance of the house can be way much better and comfortable enough for the house owner since there are no messy items placed anywhere in the room so that there are free spaces. Almost all rooms in the house need each own arrangement in case to make them neat and comfortable. 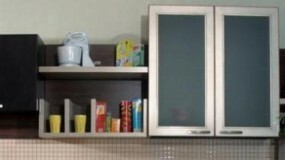 One of the rooms which need to be arranged in special way is the kitchen. How could it be? Well, there are some reasons and ways which we can learn about this kitchen arrangement. Kitchen area has so many stuffs, such as the racks, cabinet, stove, or some cooking appliances which are a lot in numbers. If we just put those things in messy way, then the kitchen area will be full and look so crowded and not comfortable enough to be used as a cooking places. We need some tricks in arranging those stuffs in a kind of storage. Arranging some stuff on the racks can make the cooking job easier to do, but we must take a note that the arrangement must consider the frequently used appliances so that the cooking activity can be done effectively. The key of this arrangement is about the items placement. Make a list started from the food ingredients, cooking tools, and other appliances needed in the kitchen. Choose the most frequently used items for the cooking activity. Arrange those items by making and order based on the most frequently used item into the most rarely used item. Put the most frequently used item in an easy to be reach area, and the most rarely used item in the far area which is hard to be reached.